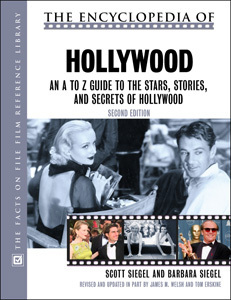 The only book that combines stars, films, genres, and history into one encyclopedic reference, The Encyclopedia of Hollywood, Second Edition provides an authoritative, unique insight into America's globally popular film industry. Since writing the first edition of this book more than a decade ago, the authors have become well-known film critics, and they bring their experience, insider knowledge, and detailed understanding of Hollywood to each entry. With approximately 170 photographs, the second edition makes the most of the authors' expertise and provides comprehensive coverage of Hollywood. The Encyclopedia of Hollywood, Second Edition is a must-have reference to the history of American filmmaking, from its emergence to the present. The entries are entertaining and will appeal to anyone who has ever seen a Hollywood film and wanted to know more about it. Coverage includes the legends of the silent screen, the great stars of the Golden Age of movies, the most powerful and important studios, key producers and directors, child stars and animal star favorites, composers, the Academy Awards, film genres, topical subjects such as “screenwriter,” basic Hollywood terms, and much more. "The coverage is accurate...entertaining, recommended..."
"...easy to use...a welcome addition to the circulating as well as the reference collection." "...attractive for its broad sweep of the Hollywood scene. For all libraries."